This Conference will be the 68th in a series of conferences held in Austria as well as in Germany and in Switzerland. The 68th ÖPG conference is organized by the Institute of Experimental Physics at the TU Graz, Austria, and will take place in the Physics building, postal address Petersgasse 16, 8010 Graz. 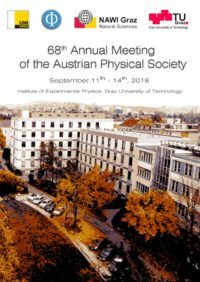 The purpose of this conference is to promote and disseminate the physical sciences in research, development and teaching, to bring the Austrian physicists from all fields closer together and to represent their entirety to the outside world. Nuclear and Particle Physics; History of Physics; Physics and School; Medical Physics; Biophysics and Environmental Physics; Research with Neutron and Synchrotron Radiation; Surfaces, Interfaces and Thin Layers; Physics-Industry and Polymer Physics. Both, oral and poster presentations are planned for all the above named topics.